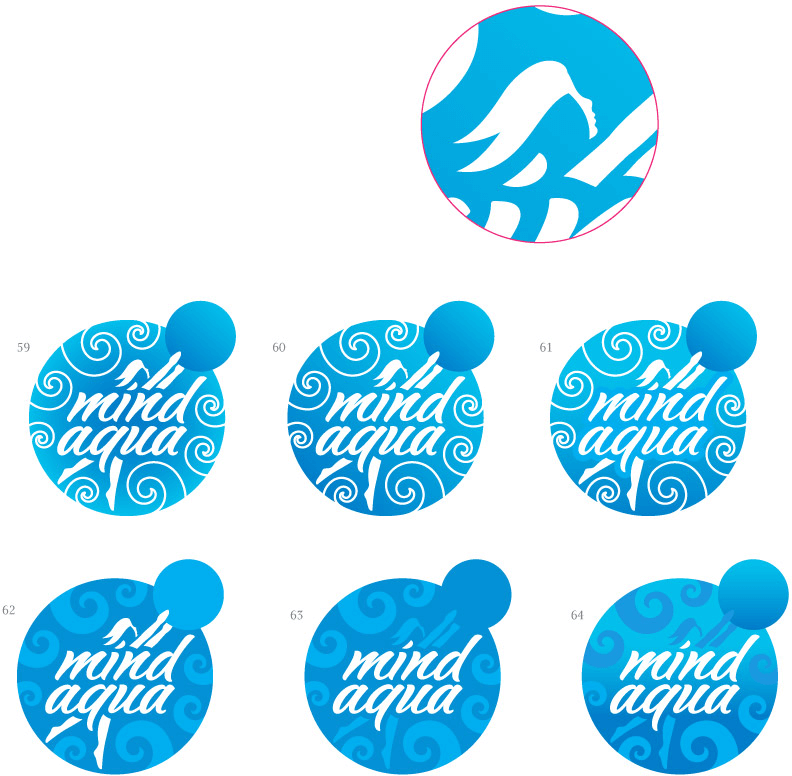 Client: Our company MindAqua is planning to promote and develop aquafitness in Russia. This branch of fitness is hardly familiar to the wide audience which is why it is so underrated. A recognizable logo is just what we need to make the first step in the right direction. 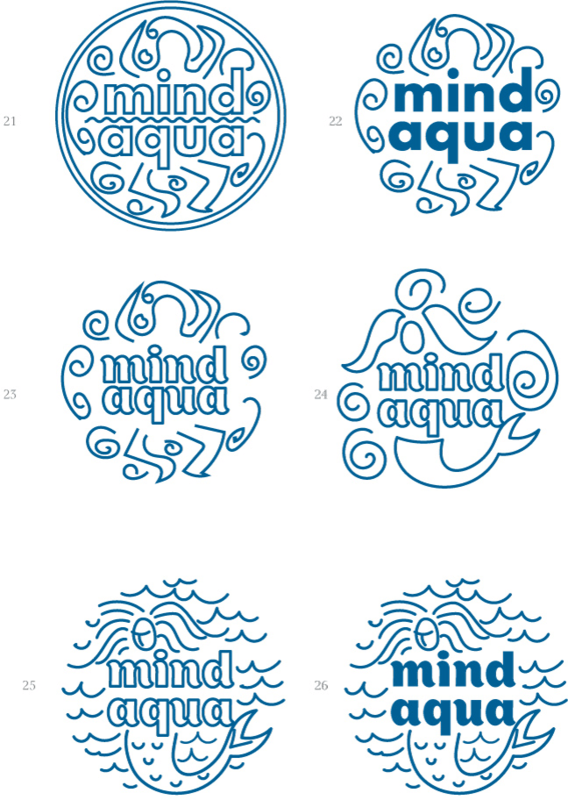 I’ll start by saying that I’ve never seen a good logo about water or aquafitness, which is why it’s difficult for me to have any expectations. 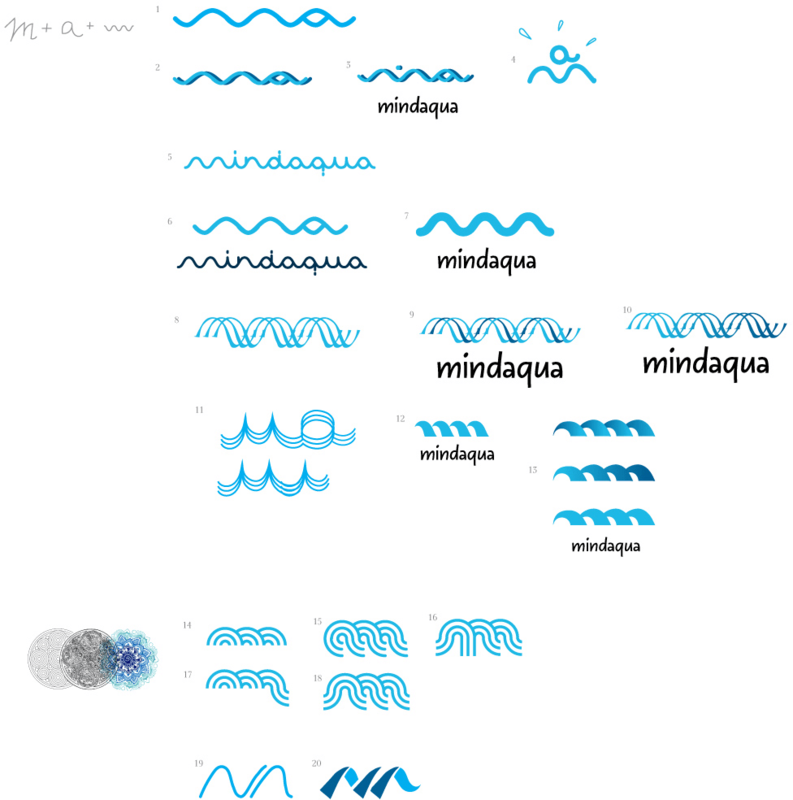 My company is called MindAqua, this is how I’m trying to communicate a mindful approach to water-based training. I see the logo as a mandala or its part and a silhouette of a person working out in the water. Unfortunately, I’m not sure: is a logo just a symbol or both a symbol and a name? I would like to have both graphics and text, for example a mandala and a MindAqua caption. 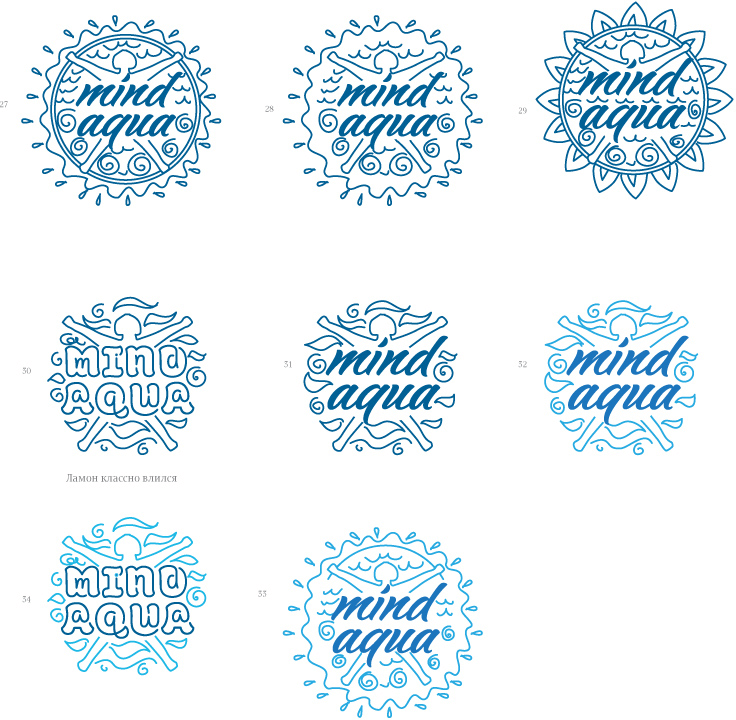 Both for the logo and the corporate identity I see a prevalence of blue colors and water motifs with a pattern made of the logo. Designer: The first ideas that surface have waves rhyming with the letter M.
Art director: It can be something between 23 and 24. But no mermaids. 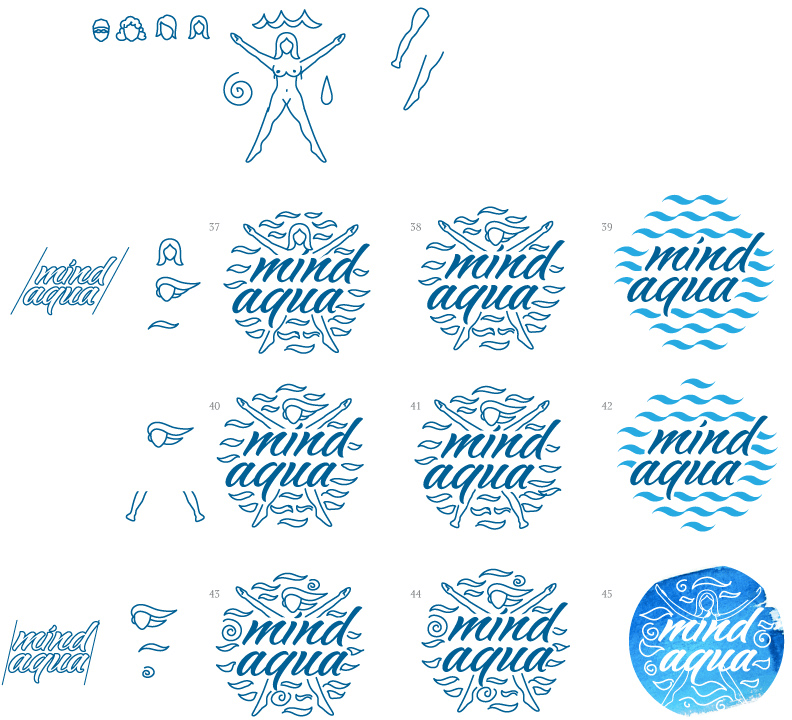 And be sure it doesn’t look like an Aqua Minerale logo. Art director: 31 is OK. Just make sure whatever’s below the person doesn’t look like balls or underwear. And make the water look more like leaves. Designer: Looks like the old Bonaqua logo? Art director: Yep, but 58 looks interesting. The text is barely readable though and you can’t make out the girl. Art director: 62 is OK. You can keep 59 as an alternative version.